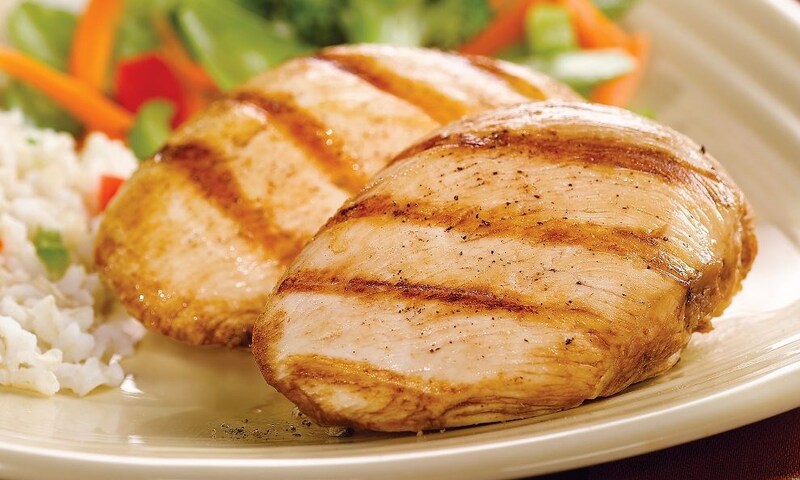 Golden, perfectly trimmed, tender and juicy chicken breasts. 100 percent natural chicken without pumps, chemicals, or preservatives. In a bowl, combine all breading ingredients and toss gently. Dip chicken in egg yolks and dredge with breading. Note: Buy chopped walnuts rather than whole, they cost less and save time. Flatten chicken breasts to 1/2 inch thickness between two sheets of plastic wrap with a mallet or rolling pin. Place chicken breasts in glass baking dish. In a blender combine oil, lime juice, garlic, cilantro, jalapeno and salt and pepper. Blend until smooth and pour over chicken. Cover with plastic wrap and let chicken marinate for 30 minutes. In a large skillet over medium heat oil. Add onions and peppers and cook until they are tender and begin to brown. In a 9x13 glass baking dish toss potatoes with oil and seasonings. bake in 375° oven until crispy, about 30 minutes. Stir occasionally to prevent sticking. Heat a cast iron grill pan or an outdoor grill. Toast flour tortillas for about 30 seconds per side and keep warm in an aluminum foil pocket. Grill the chicken on each side for 4-5 minutes. To serve slice chicken into even strips. Serve hot with onions and peppers, potatoes, grated jack cheese, salsa and sour cream. Place chicken into 9 X 13 pan. Lightly salt and pepper. Top with dried croutons and drizzle with butter.